Taroom /təˈruːm/ is a town in the Shire of Banana and locality split between the Shire of Banana and the Western Downs Region in Queensland, Australia. At the 2016 census, Taroom had a population of 869 people. The town is located on the Dawson River and the Leichhardt Highway, 380 kilometres (240 mi) north west of the state capital, Brisbane, 261 kilometres (162 mi) from Rockhampton and 302 kilometres (188 mi) from Toowoomba. Prussian explorer Ludwig Leichhardt passed through the district in 1844, carving his initials and date on a coolibah tree that now stands in the centre of town. Leichhardt's carving is no longer visible following an alleged attempt to remove bark growing over the initials that removed the initials as well. Reporting the rich soils in the area, settlers began taking up land in 1845 and by 1850 a town had been established at a popular camping spot near the Dawson River. Originally named Bonners Knob the town was renamed Taroom, possibly after the nearby Taroom cattle station, on completion of the first post office in 1856. The name Taroom is said to be an aboriginal Waka word tarum meaning wild lime. Situated 40 kilometres (25 mi) west of Taroom is Hornet Bank Station which was the site of the 1857 Hornet Bank massacre, the genocidal reprisals for which led to the Yeeman Indigenous language group and people being wiped out. The town was surveyed by Clarendon Stuart in 1860. Taroom is the oldest inland town in Queensland after Ipswich. Taroom State School opened on 11 April 1871 as a primary school. In 1964, the school had a secondary department added to provide secondary education to Year 10. In 1883, Taroom police officer William O'Dwyer was killed after being struck in the head with a tomahawk by a man he was attempting to arrest near Wandoan. The suspect was immediately shot dead by an accompanying police constable. O'Dwyer died from his injuries thirty minutes after being struck, and was buried at Wandoan. A plaque was unveiled on 7 September 2012 by Assistant Police Commissioner Paul Wilson on a rock in front of the Taroom Police Station to commemorate O'Dwyer being killed in the line of duty. Taroom Aboriginal Mission operated until 1927, when it was closed and its residents moved to Woorabinda, Queensland. The Taroom War Memorial commemorates residents of Taroom Shire who served in World War I, World War II and the Vietnam War. It is located at the Ludwig Leichhardt Park in Yaldwyn Street and was dedicated in about 1973. The Taroom Town Hall was built in 2004, immediately next door to the shire council chambers. It was intended to serve as a civic and recreational centre for the town and has a main auditorium that seats 300 people as well as a commercial kitchen and bar. The hall was awarded a regional commendation by the Royal Australian Institute of Architects in 2004. The current Taroom Public Library opened in 1976. Taroom made national news headlines in December 2014 when a man and two children were found near the town after being missing for eleven days. The trio, consisting of Steve Van Lonkhuyzen and his two young sons, had departed the Brisbane suburb of Lota on 11 December 2014 for a road journey to Cairns when they became stranded in Expedition National Park north-west of Taroom, after their four-wheel-drive vehicle became bogged. The Queensland Police Service appealed to the public to help locate the father and his two sons after they were reported missing when they failed to reach Cairns as scheduled on 15 December 2014. The last known communication from the man was a phone call made from Taroom. A local Taroom grazier eventually located the trio on 21 December 2014 while he was searching the national park looking for them after seeing media reports about their disappearance and realising he had witnessed their vehicle enter the national park several days earlier. It was reported they had survived by collecting rainwater and eating mouldy bread. The two boys were admitted to Taroom Hospital as a precautionary measure due to malnutrition. On 29 September 2018, Taroom & District Historical Society Inc and Taroom RSL Sub Branch worked together to preserve the 1973 War Memorial by moving it from Leichhardt Park to the Taroom Museum at 17 Kelman Street, Taroom (on the original site of the Taroom State School 1871-1956). Taroom was part of the Shire of Taroom until the local government amalgamations of 2008 resulted in the Shire of Taroom being split with the northern part (including Taroom itself) becoming part of the Shire of Banana and the southern part becoming part of the Dalby Region, later renamed Western Downs Region. The Banana Shire Council has an administration office in Yaldwyn Street; this building is the former Taroom Shire Council Chambers. The last person to hold the position of Taroom Shire Council mayor, Don Stiller, was critical of the decision to place Taroom into the Banana Shire. In 2011, he said the town would have been much better off had it been incorporated into the Western Downs Regional Council area, which concurred with previous statements by State Member for Callide Jeff Seeney who had described the decision to make Taroom a part of Banana Shire as "outrageous". However, Western Downs Regional Council mayor Ray Brown did not support Don Stiller's viewpoint, stating that his priority was to deal with issues in his existing council area and was not interested in looking at any proposed changes to council boundaries that would bring Taroom into the Western Downs Regional Council area. Taroom is a major centre for the Queensland beef industry. Other industries includes prime hard wheat and forestry. Taroom State School is a government P-10 school located in Wolsey Street (25°38′21″S 149°48′04″E﻿ / ﻿25.639101°S 149.801055°E﻿ / -25.639101; 149.801055﻿ (Taroom State School)). For 94 years, Taroom also had a Catholic primary school called St Mary's Primary School. However, the Catholic Education office in Toowoomba announced in April 2015 that it would be closing St Mary's School in Taroom on 26 June 2015. The closure of St Mary's means St John's School in Roma and St Joseph's School in Chinchilla are now the closest Catholic schools to Taroom. The principal of St Mary's said he was not allowed to publicly comment about the matter but the executive director of Catholic Education in Toowoomba said in a statement the decision to close the school was made with "careful consideration". Banana Shire Council operates a library at 24 Yaldwyn Street. Taroom has a rare windmill of an unusual design located on the banks of the Dawson River. The windmill was produced by the Steel Wings Company, in North Sydney between 1907 and 1911, one of only six models ever erected. The windmills comprise a steel frame and fan which turns to the wind between a bearing at the bottom and a swivel at the top, all supported by guy-wires. Along with another example in Jerilderie in the Riverina, the fully restored windmills are the only two known working examples in the world designed so their fan is contained and spins within the fully pivoting frame. There is a lookout at the top of Kelman Street, known as Gilbert's Lookout in honour of John Gilbert, a naturalist with Ludwig Leichhardt's 1844 expedition. There is a memorial to Gilbert at the lookout. Gilbert was killed when he was speared by an Aboriginal at the Mitchell River near Dunbar, Queensland near the Gulf of Carpentaria. The lookout offers panoramic views of the town and surrounding countryside. In 2013, a proposal was put forward to renovate and convert the former Taroom Shire Council Chambers into a tourist attraction that would detail the life and achievements of Ludwig Leichhardt. Banana Shire councillor Vaughan Becker said the characteristics of the Leichhardt Centre would incorporate the feeling of a museum, interpretive centre, educational resource and a tribute to the explorer's achievements. Councillor Becker met with representatives from the German Embassy, Department of Foreign Affairs, Queensland Museum and the University of Queensland to discuss the proposal. Sue Boyce, Ken O'Dowd and Banana Shire Council mayor Ron Carige all publicly supported the proposal. Isla Gorge National Park, Precipice National Park and Expedition National Park are all nearby. Bus Queensland provides long-distance coach services throughout inland Queensland, including a Toowoomba-Rockhampton service that Taroom residents are able to utilise. The Rockhampton-bound service stops in Taroom on Mondays, Wednesdays and Fridays while the return Toowoomba-bound service stops in the town on Sundays, Tuesdays and Thursdays. The Taroom Airport is located 20 kilometres south-east of the town and is used by private aircraft, emergency services and the resource industry to fly workers in and out of the region. In 2015, it was announced that Banana Shire Council was awarded over $124,000 in funding to upgrade the animal-proof fence at the airstrip. At the time then-Banana Shire mayor Ron Carige said the council was negotiating with QGC hoping the company would increase their usage of the airport. He also said an upgrade of the airport was in progress as it had become an integral part of the shire's infrastructure. Truck drivers frequently pass through Taroom either utilising the Leichhardt Highway, the Roma-Taroom Road which connects with the Carnarvon Highway north of Roma or the Taroom-Bauhinia Road which connects with the Dawson Highway between Bauhinia Downs and Moura. Trucks are frequently seen parked near the northern entrance of the town as drivers use Taroom as a convenient place to take their designated breaks, check their loads and eat meals during their long journeys between the southern and central regions of Queensland. In 1972, three men were killed when a stationary truck carrying ammonium nitrate which had caught fire exploded on the Taroom-Bauhinia Road, north-west of Taroom. The three men included the driver and two brothers from a nearby property who had ridden up to the burning truck on motorbikes to assist with the initial fire, which was believed to have been caused by a fault with the truck's electrical system. As the three men were standing near the truck, a significant explosion occurred which burnt out more than 2,000 acres of surrounding bushland, uprooted trees and left a deep crater in the ground where the burning truck had been parked. It was reported that the explosion was so loud that it was heard in Moura and Theodore with debris from the destroyed truck scattered up to two kilometres away. A memorial to the three men was unveiled in Taroom, which led to another one being erected at the accident site in 2013. Unlike many towns in the district including Theodore to its north and Wandoan to its south, Taroom never managed to achieve a rail link to the town. This was despite a long hard-fought campaign from members of the Taroom community who constantly lobbied the state government throughout the early 20th century in a bid to convince them to extend the Wandoan railway line to the town. During the town's campgaign for the railway extension, a local lobby group called the Taroom Railway League was formed. Delegates from Taroom met with government representatives on numerous occasions  to discuss the issue but the propsoal was consistently rebuffed by the government who reasoned that they'd find it difficult to finance despite it providing Taroom with a convenient link to Toowoomba during a time when not many people own motor vehicles and those who did found long-distance travel slow and difficult due to inferior dirt tracks over challenging terrain. The lack of government interest combined with the war and the infestation of invasive Prickly Pears the region endured constantly stonewalled the project. Another proposal surfaced in 1939 for a railway over the Carnarvon Range to link Springsure with Wandoan via Rolleston and Taroom. Discussion of the railway link between Wandoan and Taroom continued into the 1940s but improved conditions of the roads, faster vehicles and the demise of many railway branch lines, the enthusiasm for the rail link to Taroom dissipated in the latter half of the 20th century. There is a current proposal to construct a Surat Basin railway line to connect the Western railway line system at Wandoan with the Moura railway line for the transportation of coal to the Port of Gladstone. According to maps of the proposed line, it is expected to bypass Taroom in favour of a faster and shorter link between Wandoan to Banana via Cracow. With the township situated on the banks of the Dawson River, the community of Taroom experiences occasional flooding and has recorded four significant major floods since European settlement. Taroom's biggest flood occurred in 1890 with floodwaters reaching 8.74 metres above ground level. The height of this flood is marked on the bottom of the Leichhardt Tree in Yaldwyn Street as a reminder of the enormity of the 1890 flood. The town's second biggest flood was recorded in December 2010 during the statewide 2010-2011 Queensland floods disaster when the floodwaters of the Dawson peaked on 29 December 2010 at 4.39 metres above ground level, isolating Taroom for several weeks. The flood severely damaged the local service station  and a couple living on a remote cattle property near Taroom were stranded on their roof for eight hours before being rescued by helicopter. After the floodwaters had receded, a charity event was held at the Leichhardt Hotel in Taroom to raise money for flood victims. The event was attended by rugby league player Jason Hetherington and rugby league commentator Jason Costigan. A total of $24,000 was raised which was donated to the Taroom District Cancer and Palliative Care Group who then distributed it amongst local flood victims. A Taroom resident collated photographs of the flood and included them in a book entitled Taroom 2010-2011: Rain, Rain, Go Away. Come Again Another Day with money raised from the sale of the book being donated to local flood victims. Smaller floods preceded and succeeded this major flood event when the Dawson River flooded in March 2010  and April 2011. The 2010 flood also illustrated how valuable the river height recorded at Taroom is to people that live near the Dawson River further downstream, such as those living in or near towns like Theodore, Moura, Baralaba and Duaringa. As such, the river heights at Taroom also served as a good indication on how much floodwater was ultimately going to flow through Rockhampton as the floodwaters in the Dawson River met the already swollen Mackenzie River and entered the Fitzroy River. When the Dawson River at Taroom began reaching such great heights, eventually peaking at 10.43 metres (4.39 metres above ground level), it signalled to the authorities that a mass evacuation of Theodore was needed to be organised as the river was likely to inundate the entire town when the floodwaters from Taroom arrived. The third biggest flood in Taroom was recorded in 1956 when the river peaked at 3.23 metres above ground level on 11 February 1956. This flooding, combined with serious flooding of the Nogoa River caused high flood levels to be recorded in Rockhampton on 23 February 1956. Taroom's fourth largest flood occurred in 1983 when the waters in the Dawson River rose to peak at 1.42 metres above ground level. All four major floods are marked on a colour-coded flood marker pole located at the northern entrance to the town near the Steel Wing's windmill. The colour of the individual markers correspond with the colour of the text on the information board which surrounds the pole. The flood marker was installed after the 2010 event with funding provided as part of a Community Development and Recovery Package, which was a joint initiative between the Australian Government and the Queensland Government. Providing an adequate river crossing enabling travellers on the Leichhardt Highway to cross the river at Taroom has proved challenging due to the flooding the Dawson River experiences. In total, four bridges have been constructed across the Dawson River. The first bridge was built in 1863. The second bridge was opened in 1863 and the headstock and some of the original piles are still visible today. A third bridge was constructed across the Dawson River in 1956 and still exists today. Although it is now closed to vehicular traffic, it remains open for pedestrians and cyclists. This bridge is also a popular spot for local fisherman to sit and cast a line into the river. Taroom's fourth bridge is the William Harold Copeland bridge which was opened in 1990 and named after the mayor of the Taroom Shire. Although constructed above what is classed as normal flood level, it is still closed when major flooding occurs. Every January, Taroom holds its New Year Races. In March there is the annual St Patrick's Day campdrafting competition, while the Golden Horse Shoe campdraft is held every April. The annual Taroom Agricultural Show is held in May. Taroom hosts a fishing competition each year in June at the Glebe Weir (25°27′55″S 150°02′01″E﻿ / ﻿25.4652°S 150.0337°E﻿ / -25.4652; 150.0337﻿ (Glebe Weir)). The Australian Professional Rodeo Association hold a rodeo every year in Taroom in July. In September, there is the annual Leichhardt Festival and the Spring Races. The Taroom Polocrosse Carnival is held annually. Taroom itself does not have a local newspaper but Biloela's weekly newspaper Central Telegraph frequently carries news relevant to the Taroom area, and also published a weekly column written by a local Taroom correspondent which primarily details the social events held in Taroom. Other regional newspapers from the Darling Downs and Maranoa regions are available at the local newsagency including Roma's Western Star, the Chinchilla News and Toowoomba's The Chronicle. Although Taroom does not have a local radio station, there are several FM repeaters located in the town to ensure clear reception of various radio stations that broadcast from elsewhere, including ABC Southern Queensland, ABC Radio National, The Breeze, Rebel FM and Vision Radio. Although Taroom is generally considered to be part of Central Queensland, as the town is located within the Banana Shire, and within the electorates of Callide and Flynn, it's actually located outside both the Rockhampton and Toowoomba television licence areas, falling within the Remote Central and Eastern Australia licence area. Therefore, instead of receiving Rockhampton television stations which transmit to Gladstone, Biloela and as far south as Theodore, or the Toowoomba stations which transmit as far west as Miles, Taroom receives Imparja Television, Southern Cross Television and Ten Central from Central Australia via the Viewer Access Satellite Television service. The local Central Queensland and Darling Downs editions of WIN News and Seven News can still be accessed along with other regional news services on the 401-420 channel range on the VAST service. Australian country music performer Josh Arnold has worked with members of the Taroom community on two occasions while filming music videos as part of his Small Town Culture initiative. In 2013, Arnold filmed a video in and around Taroom featuring local children in various scenes singing their school song entitled Let's Rise Together Taroom. In 2016, Arnold returned to Taroom to again film local children who were incorporated into a music video alongside other school students and local residents from other parts of the Banana Shire for a song called Get Ready To Grab N' Go. The production of the song and video was initiated by the Banana Shire Council for their Community Recovery Program which is aimed at keeping people in the shire prepared for times of natural disaster such as flooding and cyclones. ^ a b c Australian Bureau of Statistics (27 June 2017). "Taroom (SSC)". 2016 Census QuickStats. Retrieved 31 October 2018. ^ a b c "Taroom (town) (entry 33384)". Queensland Place Names. Queensland Government. Retrieved 15 May 2014. ^ a b "Taroom (locality) (entry 43728)". Queensland Place Names. Queensland Government. Retrieved 15 May 2014. ^ "Tarooom - locality in the Western Downs Region (entry 47750)". Queensland Place Names. Queensland Government. Retrieved 18 September 2017. ^ a b Australian Bureau of Statistics (31 October 2012). "Taroom(SSC)". 2011 Census QuickStats. Retrieved 15 May 2014. ^ "Opening and closing dates of Queensland Schools". Queensland Government. Retrieved 15 May 2014. ^ "Agency ID5737, Taroom State School". Queensland State Archives. Retrieved 16 May 2012. ^ "Taroom P-10 State School secondary department turns 50!". Taroom State School. Retrieved 16 May 2014. ^ Fallen officer recognised 120 Years On, ABC News, ABC online, 7 September 2012. Retrieved 7 November 2016. ^ "Taroom War Memorial". Monument Australia. Retrieved 16 May 2014. ^ "Taroom War Memorial". Queensland War Memorial Register. Queensland Government. Retrieved 16 May 2014. ^ "Taroom Town Hall". ThomsonAdsett (architects). Archived from the original on 17 May 2014. Retrieved 16 May 2014. ^ "Queensland Public Libraries Statistical Bulletin 2016-2017" (PDF). Public Libraries Connect. November 2017. Retrieved 22 January 2018. ^ Brisbane man Steve Lonkhuyzen, two sons found safe in outback Queensland, ABC News, ABC online, 21 December 2014. Retrieved 7 November 2016. ^ Help needed to find family last seen on Darling Downs, Chinchilla News, 18 December 2014. Retrieved 7 November 2016. ^ Grazier who located father, sons stranded in outback Queensland says they were 'pretty hungry', Marlina Whop, ABC News, ABC online, 22 December 2014. Retrieved 7 November 2016. ^ Remarkable tale of survival for Queensland family lost for 11 days in the outback, 9 News, 22 December 2014. Retrieved 7 November 2016. ^ Father rationed food to keep sons alive in outback, Kim Stephens, Brisbane Times, 22 December 2014. Retrieved 7 November 2016. ^ Hero farmer Tom Wagner 'just had to find' missing boys and father in outback Queensland, news.com.au, 23 December 2014. Retrieved 7 November 2016. ^ "Contact Us". Banana Shire Council. Retrieved 16 May 2014. ^ "Queensland State and Non-State Schools". Queensland Government. Retrieved 15 May 2014. ^ St Mary's School closure leaves parents short of option, Hayden Smith, Chinchilla News, 1 May 2015. Retrieved 6 November 2016. ^ "Library: Branches & Opening hours". Banana Shire Council. Retrieved 8 May 2017. ^ "John Gilbert". Monument Australia. Retrieved 16 May 2014. ^ "Taroom". Dawson River Towns Inc. Retrieved 16 May 2014. ^ Councillor keen for Ludwig Leichhardt museum, Paul Robinson, ABC News, ABC online, 29 July 2013. Retrieved 6 November 2016. ^ Leichhardt Centre Steps Forward, Rebecca Hafner, Central Telegraph, 5 August 2013. Retrieved 6 November 2016. ^ Three die in chemical blast, The Canberra Times, 1 September 1972. Retrieved 11 November 2016. ^ Enduring tribute binds community, Rebecca Elliot, Central Telegraph, 5 April 2013. Retrieved 11 November 2016. ^ Truck explosion memorial unveiled, Jacquie Mackay, Breakfast with Jacquie Mackay, ABC Capricornia, 4 April 2013. Retrieved 11 November 2016. ^ Taroom spirit shines in flood, Russel Guse, Central Telegraph, 13 January 2011. Retrieved 7 November 2016. ^ Couple's eight-hour rescue ordeal, Russel Guse, Central Telegraph, 14 January 2011. Retrieved 7 November 2016. ^ Taroom raises $24,000 in flood aid, Russel Guse, Central Telegraph, 9 February 2011. Retrieved 7 November 2016. ^ Taroom emerges from flood, Russel Guse, Central Telegraph, 5 March 2010. Retrieved 7 November 2016. ^ Taroom begins flood clean-up, Russel Guse, Central Telegraph, 12 March 2010. Retrieved 7 November 2016. ^ Incorrect web info not helpful for Taroom, Russel Guse, Central Telegraph, 6 May 2011. Retrieved 7 November 2016. ^ Theodore to be flooded for Xmas, Russel Guse, Central Telegraph, 24 December 2010. Retrieved 7 November 2016. ^ Theodore being mass evacuated, Russel Guse, Central Telegraph, 28 December 2010. Retrieved 7 November 2016. ^ Residents airlifted from flood zone, ABC News, ABC online, 28 December 2010. Retrieved 7 November 2016. ^ a b c d e f "Simple Pleasures: Banana Shire" (PDF). The Gladstone Region. Tourism Queensland. p. 3. Retrieved 8 June 2014. ^ "Fraser family grave site and memorial, Hornet Bank (entry 602075)". Queensland Heritage Register. Queensland Heritage Council. Retrieved 6 July 2013. 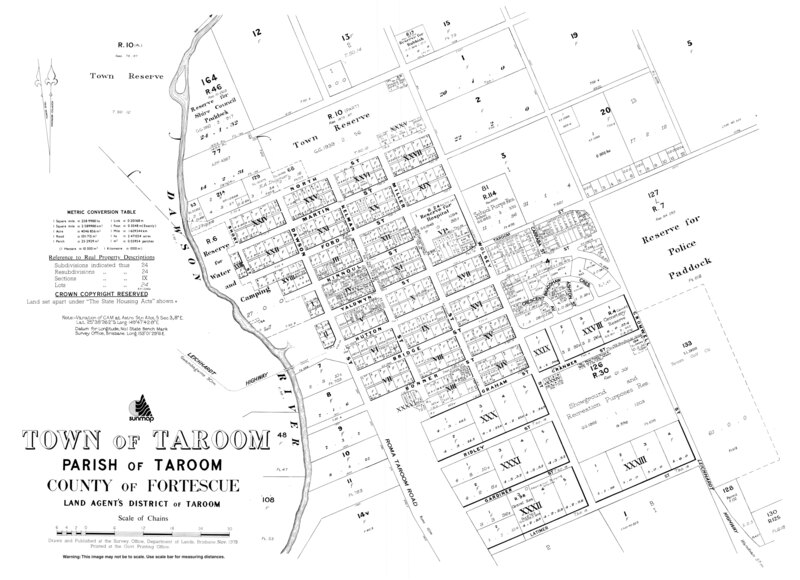 ^ "Taroom Aboriginal Settlement (former) (entry 602769)". Queensland Heritage Register. Queensland Heritage Council. Retrieved 6 July 2013. ^ "The Glebe Homestead (entry 601774)". Queensland Heritage Register. Queensland Heritage Council. Retrieved 6 July 2013. ^ "Leichhardt Tree (entry 600835)". Queensland Heritage Register. Queensland Heritage Council. Retrieved 6 July 2013. ^ Map of Regional Queensland TV1 licence area, Australian Communications and Media Authority website. Retrieved 7 November 2016. ^ Map of Remote Central and Eastern Australia TV1 licence area, Australian Communications and Media Authority website. Retrieved 7 November 2016. ^ What channels are available on VAST?, MyVAST website. Retrieved 7 November 2016. ^ Let's Rise Together Taroom, David Illife, Breakfast with David Illife, 612 ABC Brisbane, 24 February 2014. Retrieved 10 November 2016. ^ Small Town Culture & Taroom State School, Country Radio Singles (CRS) Publicity website. Retrieved 10 November 2016. ^ Australian Bureau of Statistics (9 March 2006). "Taroom (L)". 2001 Census QuickStats. Retrieved 15 May 2014. ^ Australian Bureau of Statistics (25 October 2007). "Taroom (L)". 2006 Census QuickStats. Retrieved 15 May 2014.